When mankind took to the water, shipwrecks were inevitable. As long as canoes and boats have sailed the Great Lakes there have been shipwrecks. Many have occurred in the Straits of Mackinac with its narrow channels, shoals, and harsh and changing weather. As shipping increased in the 1840s and 50s so did the number of shipwrecks. But man responded with better aids such as lighthouses, fog signals, weather forecasts, and charts. Most of the shipwrecks in the Straits occurred before 1890 and were wooden-hulled sailing vessels. Modern shipwrecks are infrequent. The western entrance to the Straits has been the most dangerous. Waters swirl and froth around White Shoal Lighthouse where the north-south fetch of Lake Michigan encounters the east-west expanse of the Straits. This transition zone is dotted with hidden shoals. Hence, more Straits shipwrecks have occurred in Lake Michigan than in Lake Huron and most have been caused by running aground. Fall is the season of high winds, turbulent seas, and shipwrecks. have the best visibility, greatest daylight, and least wind. September, October, and November are the months when the temperature differential between air and water causes high winds. November gales have caused twice as many wrecks as in any other month. • The Eber Ward turned east entering the Straits and hit ice, hard enough to sink within 10 minutes in 1909. 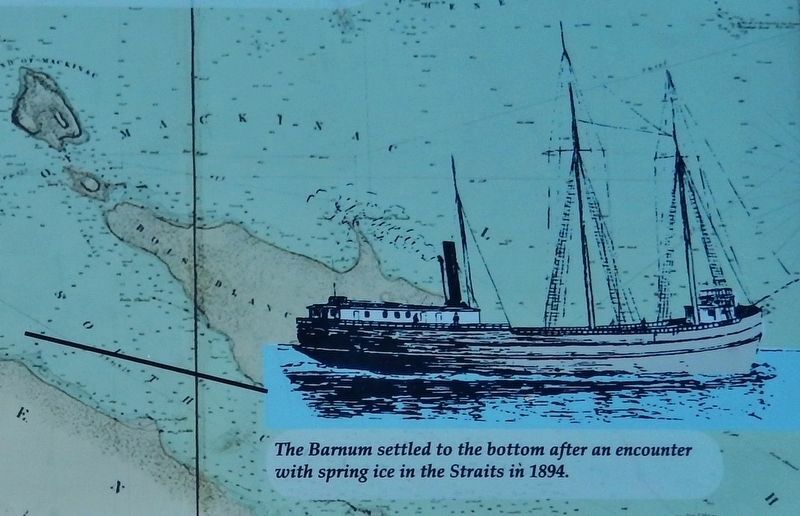 • The Barnum settled to the bottom after an encounter with spring ice in the Straits in 1894. Erected 2014 by Mackinaw City Historical Pathway. Location. 45° 47.243′ N, 84° 43.687′ W. Marker is in Mackinaw City, Michigan, in Cheboygan County. Marker can be reached from the intersection of North Huron Avenue and Henry Street when traveling north. Touch for map. 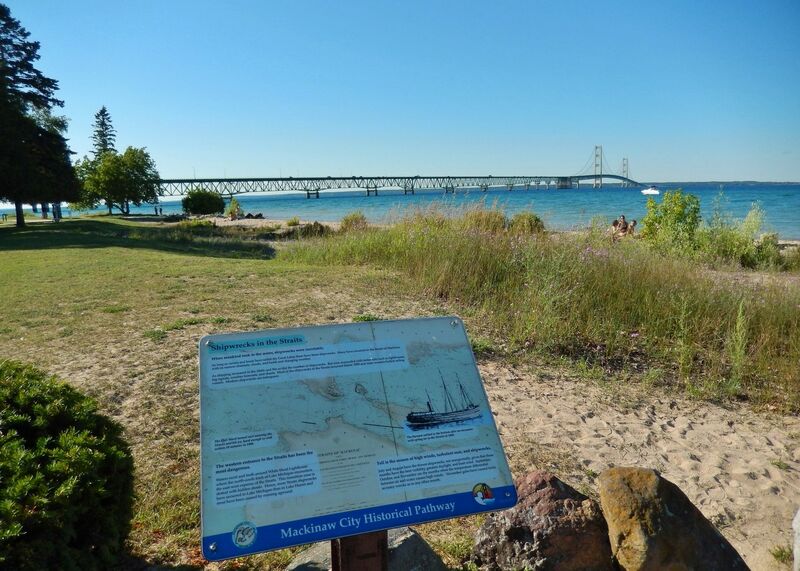 Marker is located along the Mackinaw City Historical Pathway, on the east side of Alexander Henry Park, overlooking the Mackinac Bridge and the Straits of Mackinac. Marker is at or near this postal address: 518 North Huron Avenue, Mackinaw City MI 49701, United States of America. Touch for directions. measured in a direct line); Fort Michilimackinac (approx. 0.2 miles away); Mackinac Bridge (approx. 0.2 miles away); Michigan's First Jewish Settler (approx. 0.2 miles away); a different marker also named Fort Michilimackinac (approx. 0.3 miles away); Chief Wawatam (approx. 0.3 miles away). 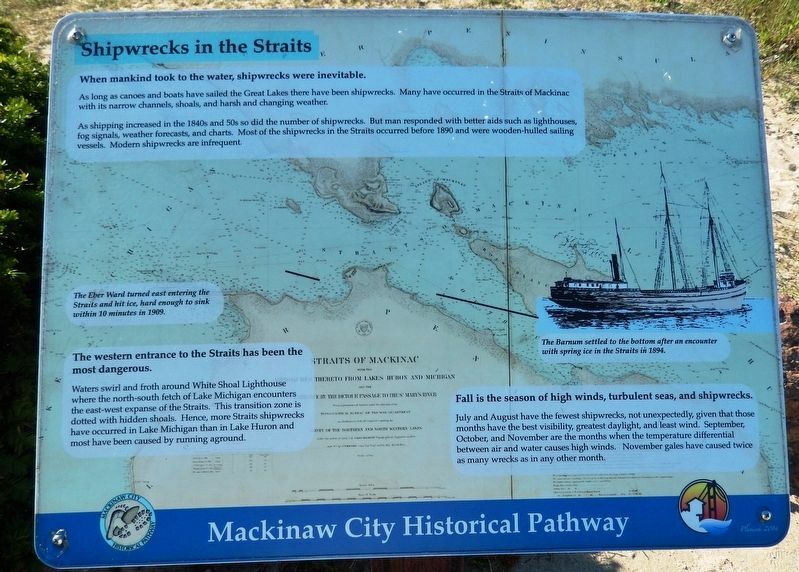 Touch for a list and map of all markers in Mackinaw City. More. Search the internet for Shipwrecks in the Straits. Credits. This page was last revised on April 4, 2019. This page originally submitted on April 4, 2019, by Cosmos Mariner of Cape Canaveral, Florida. This page has been viewed 62 times since then. Photos: 1, 2, 3. submitted on April 4, 2019, by Cosmos Mariner of Cape Canaveral, Florida.